Like Def Leppard drummer Rick Allen who lost his arm in an accident but kept on performing, aspiring drummer Jason Barnes didn't let losing his right arm two years ago deter him from realizing his dream. He built a crude prosthetic using springs that allowed him to keep on drumming, but after enrolling at the Atlanta Institute of Music and Media, he met a professor who realized he could build Barnes something better. Using insight gained from building completely autonomous drumming robots in the past, Gil Weinberg designed a prosthetic for Barnes that lets him continue to play the drums as well as he could with two arms—and maybe even better than before. 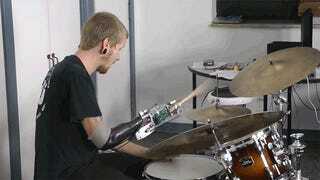 Because in addition to a small robot arm that lets Barnes accurately control a drumstick using the muscles in his upper arm, the prosthetic includes a second drumstick that plays along autonomously. It uses a microphone and accelerometer to detect Barnes' rhythm, and then automatically starts drumming along with a complementary rhythm of its own.